Battery Powered TRACKER Retrieve is a product that has its own in-built power source. This overcomes the issue of power drain on the asset's battery, even if it's left unused for a long period of time. Because it doesn't need to be wired into the electrical system, Battery Powered TRACKER Retrieve is the ideal protection for your asset. TRACKER Locate is a ground-breaking system with ""jamming' countermeasures providing the ultimate defence against vehicle theft. TRACKER Locate combines VHF with GPS and GSM technology making this system far more resilient to this form of attack. Crucially, TRACKER Locate will raise an alert to TRACKER if there is any attempt to jam the communication system. As with all of our systems, TRACKER Locate is operated by all UK police forces. Using any one of the three location technologies, TRACKER can inform the police of the initial location of the stolen vehicle. The police can then employ the precision of the VHF technology to track a stolen vehicle to its exact location. TRACKER Monitor operates using TRACKER's proven Very High Frequency (VHF) technology. In the event of theft where the vehicle is moved without the ignition turned on, the motion sensor will alert TRACKER who will in turn notify you. 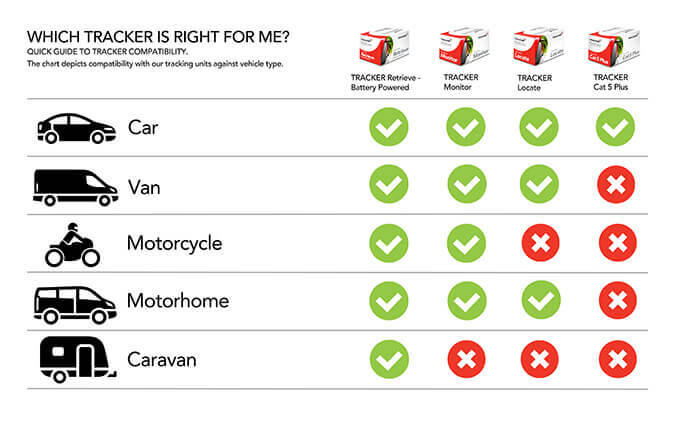 On confirmation of the theft and receipt of your police crime reference number, TRACKER will activate the unit, which will emit a silent signal allowing the police to track the vehicle to its exact location, even if it's hidden in a container or underground car park. TRACKER Cat 5 Plus meets the insurance requirements of the Thatcham Category 5 standard. In addition to GPS, this system also uses our unique VHF technology. Driver tags are provided to identify that the driver of the vehicle is authorised, if a tag is not present when the vehicle is started, an alert will be generated and the customer will be contacted to confirm the vehicle's location.